H2DANCE and what if: projects produced On/Off at Turners of Medway, a defunct auto showroom in an industrial strip facing the Thames. The company harnessed the physical power of the audience to produce the electrical power for the show, a pop-infused collage of break dance, tap and modern dance with a group of small children somewhere in the mix. The concept – the ‘On/Off’ of the title – was that audience members were in control of the piece. There was a set of bicycles affixed to the ground on either side of the space. Riding these bikes generated electricity which powered the lights and the sound. If the riding stopped, the lights went out and the music disappeared. There was a master of ceremonies who instructed the audience, and also provided some bicycle power of his own. If the biking stopped and the music and lights went down, the dancers were instructed to stop moving. 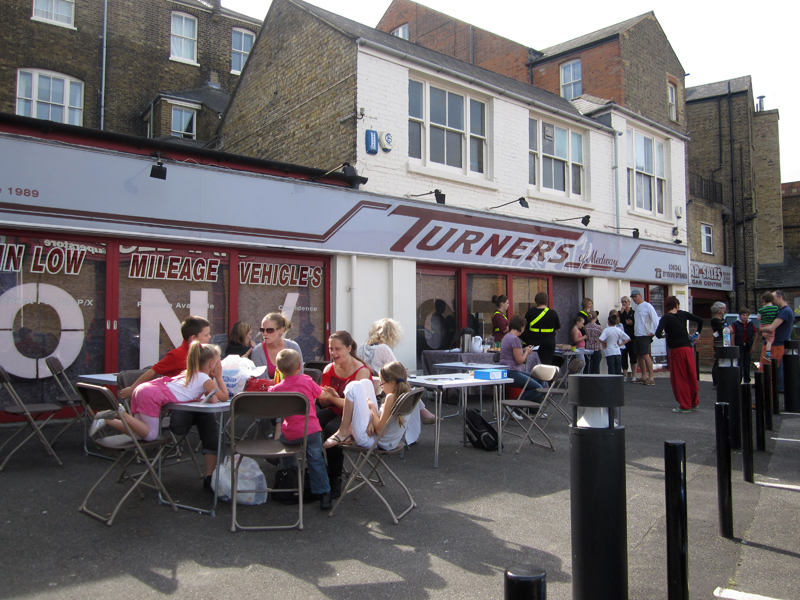 H2DANCE and What if: projects produced On/Off at Turners of Medway, a defunct auto showroom in an industrial strip facing the Thames. The company harnessed the physical power of the audience to produce the electrical power for the show, a pop-infused collage of break dance, tap and modern dance with a group of small children somewhere in the mix. 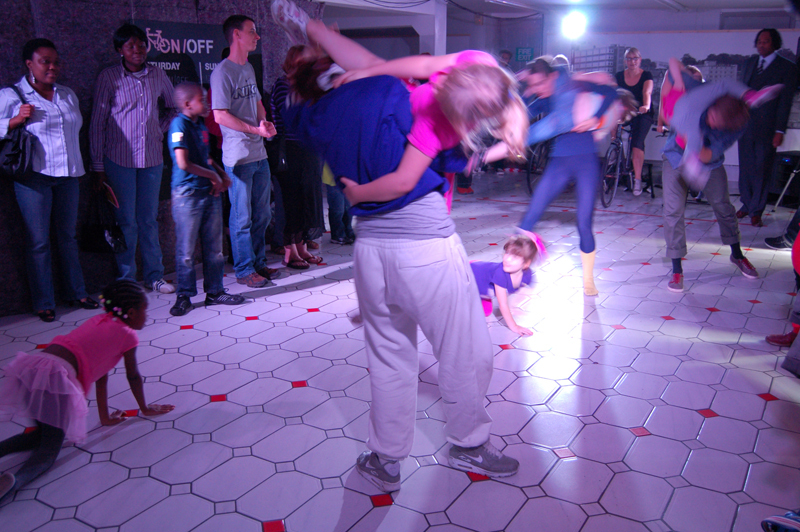 The concept – the ‘On/Off’ of the title – was that audience members were in control of the piece. There was a set of bicycles affixed to the ground on either side of the space. Riding these bikes generated electricity which powered the lights and the sound. If the riding stopped, the lights went out and the music disappeared. There was a master of ceremonies who instructed us, and also provided some bicycle power of his own (I came to a later afternoon show, the fourth of the day, and he was drenched in sweat from the effort). 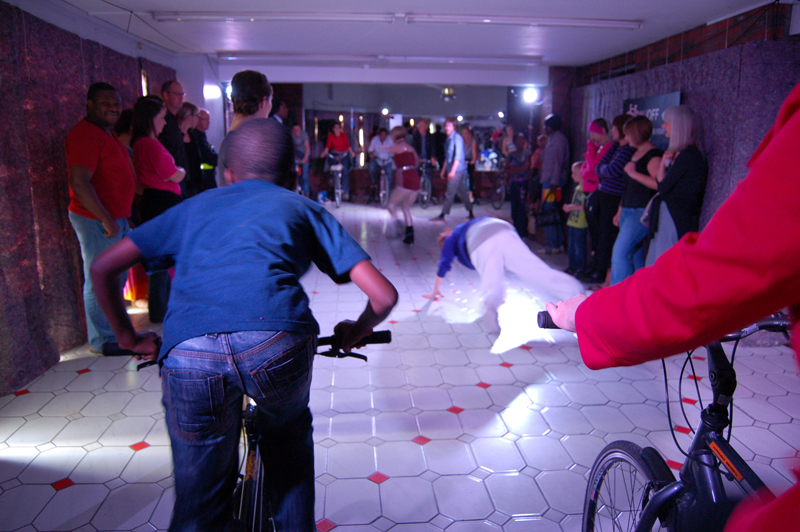 If the biking stopped and the music and lights went down, the dancers were instructed to stop moving.